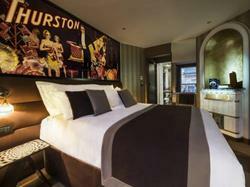 A 15-minute walk from the Arc de Triomphe, Champs Elysées and the Palais des Congrès in Paris, this boutique hotel offers free Wi-Fi access, a concierge service and illusion-themed rooms serviced by a lift. Parc Monceau is just a 5-minute stroll away. A buffet breakfast, consisting of regional specialities, is served every morning in the arched dining room or it can be taken in your room. A large range or restaurants can be found in the area.